We have over 160 goats on the farm (quite a change from the 4 I started with!) Currently we are milking about 112 of those. The rest are either too young, expecting, or boys. Each and every goat has a name, a unique personality, appearance, and place in our hearts. They are healthy and happy in our temperate climate, and are protected by our Anatolian Shepherds. We are one of the few goat dairies that have opted to "green feed" our herd. The goats diet is organically managed grass/clover, hay, alfalfa pellets, and we graze every day in 35 acres of brush adjacent to the farm. At current we are the only grass and brush fed, raw milk and cheese, Goat Dairy in Washington state. Our wonderful goats are a rare breed from Switzerland called Oberhasli (Ober-Haas-li). Their milk is increadibly crisp, sweet, and without the goaty flavor that is associated with other goat breeds. Everyday, after lunch, we take the entire herd throughout the wild spaces around the farm to graze on Blackberry, Salmon Berry, various trees and leafy-greens, Wild Rose, Canary Grass, Cattails/Horsetails, etc. 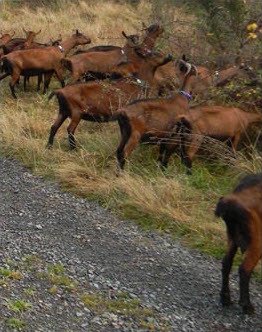 Our goats love to graze, and it is humorous and wonderful to see them dancing and kicking in excitement as they are led out of the barn and through our pastures. This varied diet of deep rooted plants provides higher density of nutrients then grass can alone, and higher nutrition supports 5 antimicrobials that confined farm animals cannot produce in milk. We also produce higher concentrations of Vitamin k2(Potassium), that is crucial to the absorption of Calcium in the body. As winter approaches, much of the wild plants and trees loose their greenery, and grazing stops. In the barn, we feed unsprayed, non-GMO grass hay and alfalfa, and the girls still feed in our three, 4 acre(roughly) pastures. Since our animals are never grained, those with common allergies to milk (such as Celiac or Gluten Intolerance), flourish on our milk and cheese products. To learn more about goat's milk and its benefits, please visit this link.